Baby knitting is fun and the projects don’t take very long to make, which makes them perfect projects for any beginner knitter. I recently bought lots of Rico Design yarn (creative cotton aran) in lovely soft spring colours and wanted to create a baby SS18 collection to share with you. All of the free knitting patterns below are easy knits, making them great starter projects for beginners or for knitflixing! 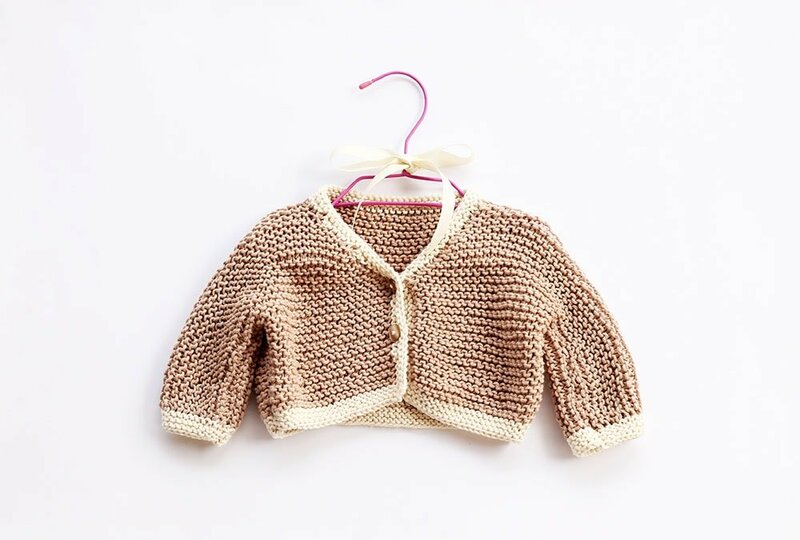 The simple baby cardigans, sweater, booties and toys require basic knitting knowledge, from using garter stitch, stocking stitch, increasing and decreasing. I wanted to get right into my basket of Rico Cotton Aran that I have been storing up for the right projects. The colours fit in with this colour theme as you can see above – the pale peach, natural white, clay (brown), sand (mustard) and greys were just perfect for the projects. I have also been working on a cotton baby blanket pattern that you can view in the colours; clay, sand, nature and pale peach. 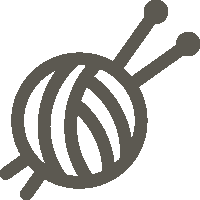 If you would like to make more knitted items for baby, please take a look at the other patterns in the baby knitting pattern library. 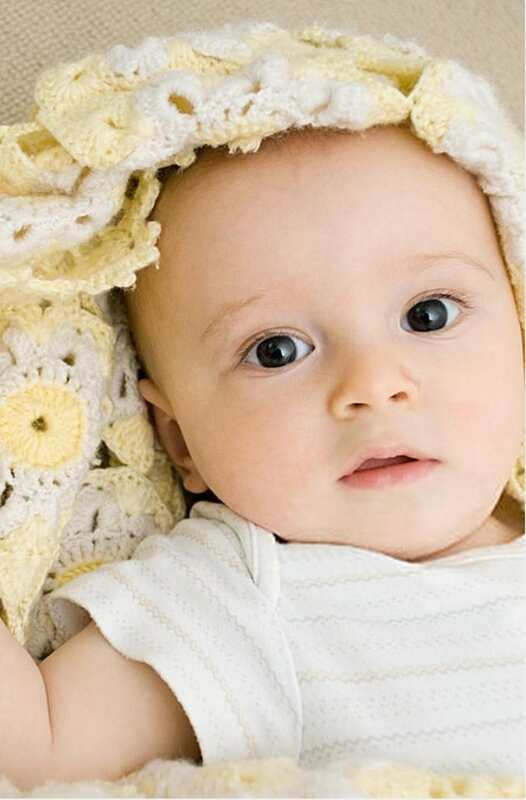 Make something new for baby in simple cotton with one of these free knitting patterns. 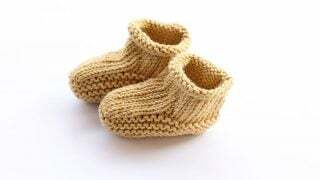 The simple baby cardigans, sweater, booties and toys require basic knitting knowledge, from using garter stitch, stocking stitch, increasing and decreasing. This two-tone simple baby sweater has been made with two really pretty yarns that had been sitting on my shelf for a good while. With a simple colour change from powder to nature, it really is a lovely simple spring sweater. 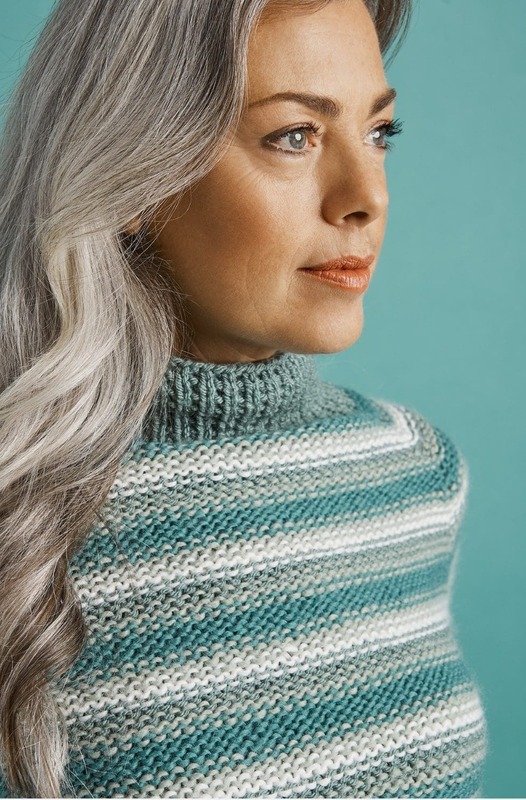 Make one of your own with Rico Cotton Aran in the colours powder (61) and nature (60). It is really easy to knit, using garter stitch and knit in one flat piece, then seamed at the sides and under the arms. This bunny toy has been knitted using a delightful light grey coloured yarn with white added in the face and at the tips of the ears. I wanted to design and make a bunny that would make a great friend to grow up with for any little one. 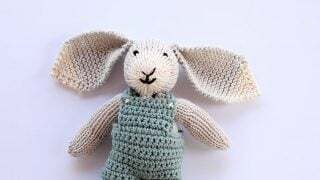 This bunny toy knitting pattern is easy and would be perfect for a beginner knitter.The overalls the bunny is wearing are crochet, so you may also need to know a little bit of beginner level crochet to make these, including how to chain and single crochet. 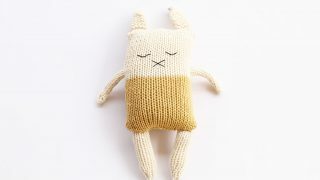 The bunny and the overalls do take quite a bit of assembling, but the end result is worth the time you put into lovingly making one of these. This chunky baby cardigan has been made using Rico Cotton Aran in clay (51) and nature (60) on size 5.5 mm (US 9) needles. It knits up quick and is a really lightweight knit for spring/summer. 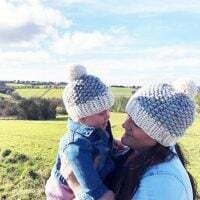 This flat knit hat knitting pattern is really quick to make, made with cotton and knit on size 4 mm (US 6) straight needles, it was really easy to make up. I don’t normally write patterns for or make hats on straight needles, as I prefer to work on circulars, but this hat worked well and you can hide the seam easily by using the mattress stitch. 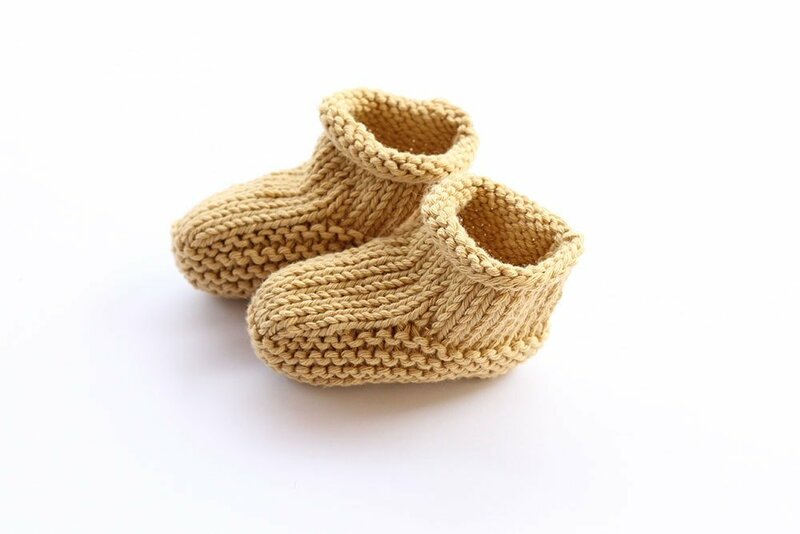 This sweet baby slippers pattern will introduce you to garter stitch if you are a beginner and to increasing, decreasing and shaping. This was knit with the gorgeous Rico Cotton Aran in pastel pink (02) and on size 4 mm (US 6) needles, they will take you about 1-2 hours to make. You can add the pom decoration to the shoe to finish it off. This bunny softie has been knitted using two coloured yarns with simple black thread stitching for the eyes and mouth. I wanted to design and make a bunny softie diy that would make a great squishy friend for any little one. This bunny softie knitting pattern is easy and would be perfect for any beginner knitter. The pattern requires basic knitting stitches, including stocking stitch and garter stitch. It also requires shaping through increases and decreases. 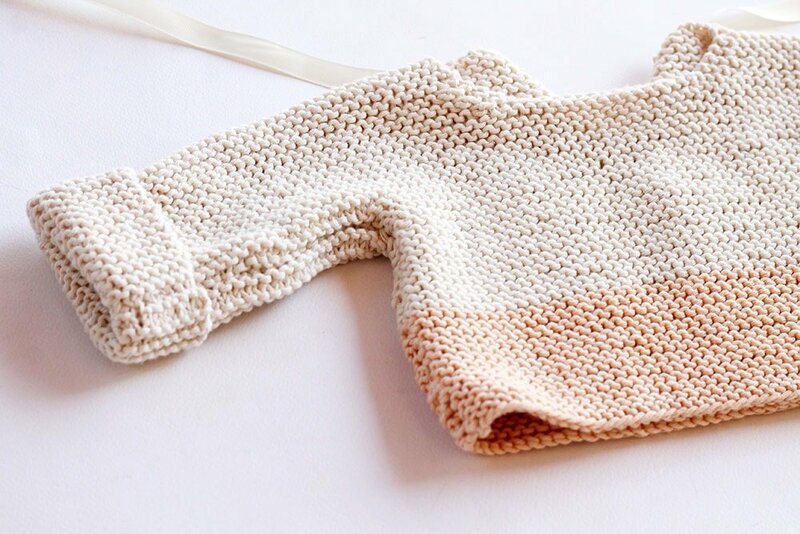 This sweet little baby cardigan knits up fast in a simple stocking stitch. If you are a beginner, this pattern will be easy for you, as it uses knit and purl stitches and will introduce you to decreasing and shaping. Made with Rico Cotton Aran in pastel green (67) it also has two buttons to close on the front band. 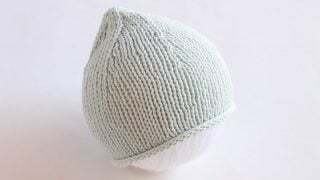 This is also a really lovely baby booties pattern to make, especially if you are a beginner, this pattern will introduce you to stocking stitch and to decreasing and shaping. This was knit with the gorgeous Rico Cotton Aran in sand (59) and on size 4 mm (US 6) needles, they will take you about 1-2 hours to make. I hope you enjoy the new free baby knitting patterns and for more free knitting patterns take a look at my free pattern library. I will be adding more each month for you to enjoy, so sign up for the newsletter or keep checking back.